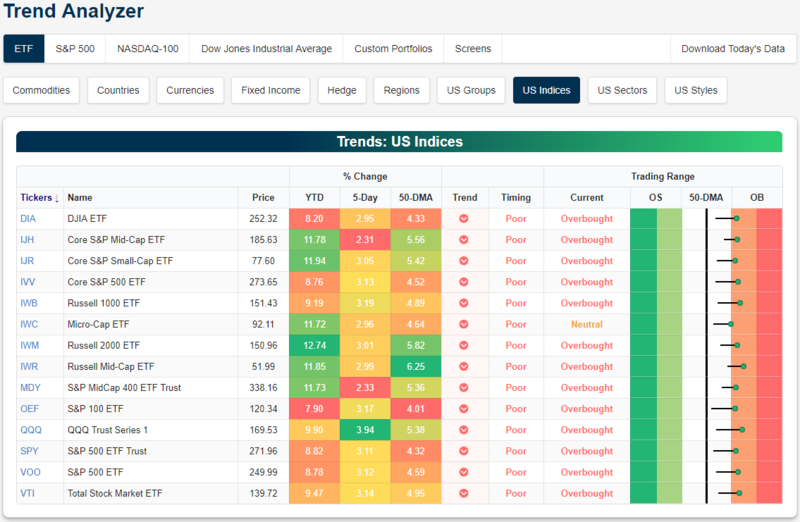 Tuesday is starting off with the major US indices trading much more firmly into overbought territory following Monday’s gains. Only the Micro-Cap ETF (IWC) still remains in neutral territory, but even it is right on the border, and it won’t take much for it to join the rest of the group. Every single other major index ETF is currently overbought. QQQ has been on a tear over the past week rising 3.94%, but while it has done well in the short term, since the start of the year, returns have been more middling. Also of note, while mid-caps have generally outperformed so far this year as each of the ETFs tracking these market caps are up well over 10% YTD, S&P mid-caps (MDY and IJH) have been lagging behind in the past week as the worst performers.